Daniels caried UConn out of early funk to 63-53 victory. ARLINGTON, Texas (AP) — Connecticut will not ride a one-man gang into the national championship game this time. Shabazz Napier is still the leader, but DeAndre Daniels and Ryan Boatright have taken their turns at the wheel. Napier was quiet early, but still finished with a steady game, finishing with 12 points and six assists. 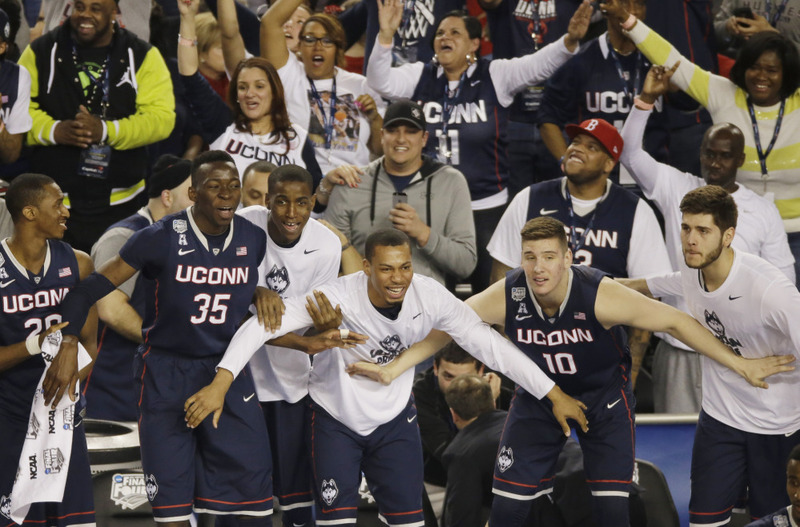 But it was Daniels and Boatright who proved to be the difference-makers for the seventh-seeded Huskies (31-8), earning them a spot in Monday’s championship game against Kentucky or Wisconsin. Daniels helped UConn dig out of a big early hole by scoring inside and out, and hit a couple of big shots down the stretch to prevent Florida (36-3) from rallying. He made 9 of 14 shots against the Gators, the top overall seed who had won 30 straight until Saturday night. Comfortable in his role as Napier’s sidekick, Boatright was like a bulldog all night, consistently getting inside Florida’s defense and combining with Napier to hold ailing Gators star Scottie Wilbekin (cramps) to four points and one assist. The Huskies had been down this road before: A scrappy, unheralded team making a deep NCAA tournament run behind a do-it-all guard who practically willed them to victories with big shots and big moments. In 2011, it was Kemba Walker darting and dashing his way through the bracket while leading UConn to its third national title — all under Jim Calhoun. Napier was a freshman on that team and learned from his mentor, becoming the carry-the-team player in Storrs many times this season. But he hasn’t done it completely alone. Boatright has been interchangeable with Napier in the backcourt, playing shooting guard when Napier runs the point, leading the team when Napier shifts to the two spot or heads to the bench. He also turned into UConn’s point-guard stopper, hounding the opposing team’s floor leader into mistakes and generally making life much harder all around. Daniels was sort of an enigma at times during the regular season for the Huskies, showing off flashes of his athleticism some games, disappearing in others. The junior forward has been steady during the NCAA tournament, though, including a 27-point, 10-rebound game in the Sweet 16 against Iowa State. Napier did most of the work in an early-season win over Florida, hitting a game-winning jumper at the buzzer while scoring 26 points in a one-point victory — the Gators’ last loss before stringing together a 30-game win streak into the Final Four. The Huskies had trouble with the spotlight in Jerry Jones’ $1 billion sports palace, falling into holes of 7-0 and 16-4 as the Gators contained Napier, for the most part. Daniels helped UConn shake its funk, hitting a pair of 3-pointers and sailing in for a dunk during an 11-0 run that got the Huskies back in it. Boatright had a quiet first half before starting to find seams in Florida’s defense. He got to the rim a few times without much hassle against the long Gators and was able to find open shooters when they did cut off his lanes. Boatright also helped lead the charge against Wilbekin, adding to his cramping woes by helping Napier hound his every step. When it was over, the Huskies again were underdogs headed to the national championship — this time with a pair of sidekicks helping the star get there.